A Great White Shark, Carcharodon carcharias, turns by the camera off the coast of the island of Guadalupe, Mexico. The white shark (proper reference), is the most talked about shark in the ocean. 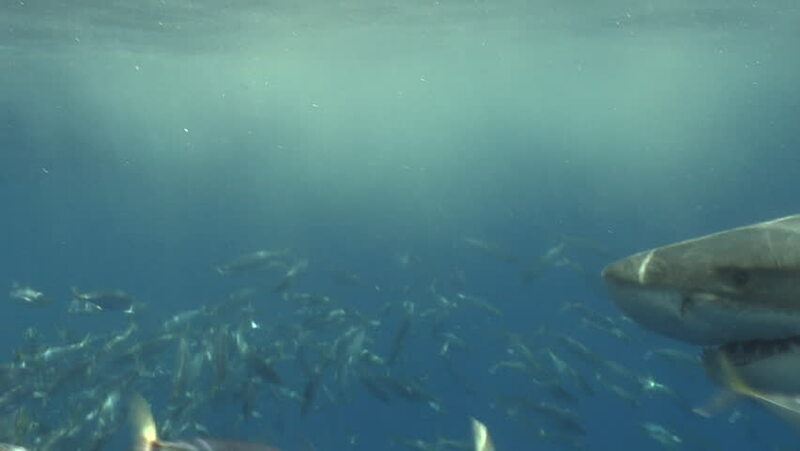 hd00:13Tuna Fish shoal on a blue background of water in ocean on Galapagos. Amazing life of underwater tropical nature world. Scuba diving. 4k00:25A shot between different beautiful school of silver fish. hd00:13Flock of seals underwater of Sea of Okhotsk.